USDA zones are based upon the average minimum temperature that a region receives. USDA zones are widely used and are found in all sorts of gardening literature, advertizing, and this is the system used in the Dave's Garden PlantFiles. They are useful, for every plant has a temperature below which it will not survive, but they also are limited. Consider USDA zone 8, for example. Cities in zone 8 include Seattle, Tucson, and Mobile. Obviously, aside from the winter lows, these are otherwise three very different climates. Sunset climate zones were developed to deal with many dimensions of climate challenges. Sunset climate zones take into consideration many aspects of climate such as summer heat or lack thereof, aridity, humidity, rainfall patterns, solar radiation, length of growing season, and ocean influence, as well as winter cold. They are widely used in the American West, where extensive high mountain ranges, the cold Pacific Ocean, highly seasonal rainfall patterns make for a much greater range of climates per area than can be found in the East. 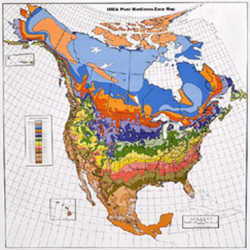 (Note how uniform the Koppen climate regions are in the East compared to the West on this map.) Sunset zones were developed by the Sunset Publishing Corporation and although originally developed for the West, there are 51 zones to cover all fifty states and adjacent Canada and Mexico. Let's examine a temperate region of the United States, USDA zones 6 and 7. At least 40 states have area that falls into this category. The summer climates can be broadly summarized. The northwest is cool and rainy. The west is warm and on the dry side. The middle and east are warm-to-hot, humid, and generally rainy. The northeast is mild and rainy. Of course not every year is the same, but the climate can be generalized in the long run. These sample locations show some of the summer variety that can be found in USDA zones 6 and 7. Juneau, Alaska and vicinity (Sunset zone A3) - The Alaska panhandle is very rainy. Some areas are temperate rainforest. The repeated freeze-thaw cycle in spring can be a challenge. Summers are cool but the longer days of summer are helpful for plant growth. Boise, Idaho, Salt Lake City, Utah, Santa Fe, New Mexico (Sunset zones 3A and 3B) - The literature makes this sound like a gardening dream zone. Summers are long and warm, usually with a growing season of at least 180 days. 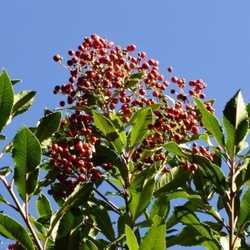 Winters are long enough and cold enough to make this an excellent climate for deciduous fruit trees and many perennials. Summer irrigation is usually necessary. Wichita, Kansas (Sunset zone 35), Virginia Beach, Virginia (zone 31), Pittsburgh, Pennsylvania (zone 40) - For much of the eastern half of the United States summers are warm-to-hot, and humid. Natural rainfall is usually adequate. Irrigation is the exception rather than the rule. The big difference between these zones is the length of the growing season. Asheville, North Carolina (Sunset zone 36) - Summers are less hot and humid than in surrounding regions at lower elevations, but be on guard for late frosts. Rainfall is generally abundant. New York City, Boston, Massachusetts (Sunset zone 34) - Summers are warm-to-hot and humid. Rainfall is ample. The proximity to the Gulf Stream makes this zone slightly more mild that the equivalent latitudes further inland. Sunset zones reach their greatest development and elaboration in California. This is probably due in part to the fact that Sunset is a Californian company but also to the fact that this is a large state with varied topography. For example, there are at least ten Sunset zones in Los Angeles County. These correspond to only three USDA zones, but a look at the natural vegetation or a topographic map shows extreme variety, from pine forests, to desert, to grassland and scrub, and from sea level to 10,000 feet. Most people live at the lower elevations, below 2,000 feet or so, but even here, weather-blocking mountains and proximity to or distance from the cold ocean have resulted in many zones. The seven zones described below would be in USDA zones 9 and 10a. Sunset zone 24 (Malibu, San Diego) - This climate is dominated by the ocean virtually all of the time and because of this, the air is rarely truly dry. Winters are mild and rarely reach to freezing. Summer days, especially mornings can be cloudy, Summer highs are often barely over 70°F right along the coast, but are routinely into the 80s where this zone reaches a couple of miles inland. The growing season is 365 days. Agriculturally, this is a region of hothouse flowers like orchids and poinsettias. 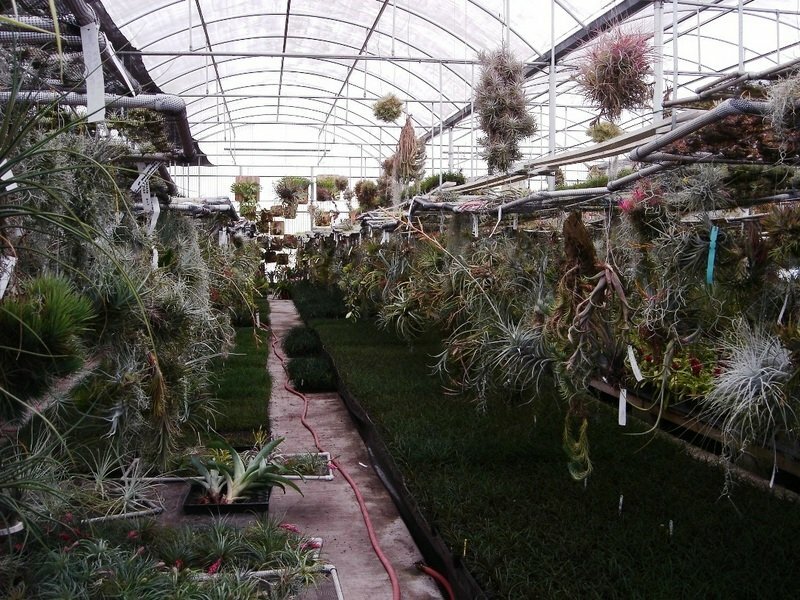 The mild climate reduces the heating and cooling costs of running a greenhouse. Zone 23 (Beverly Hills, San Juan Capistrano) - This is typically the next zone inland from zone 24. These climate is dominated by the ocean 85% of the time. Because there is less ocean influence, the summers are warmer and the winter nights are colder than in zone 24. This area can also be subject to drying Santa Ana winds. The growing season is around 350 days. Agriculturally, this is the best zone for avocados. Zone 22 (Culver City, Santa Ana) - This climate is very similar to zone 23, except that it occurs on valley floor and canyon bottoms where cold air settles at night. This can result in freezes that do not occur in neighboring zone 23. The growing season is 270 to 350 days. Zone 21 (Pasadena, Thousand Oaks) - This zone gets ocean influence about half of the time. It is subject to Santa Ana winds. It is not all that different from zone 22 except that it is drier due to less ocean influence. The growing season is from 270 to 350 days. If you live in the United States, there is a very good chance that the lemons in your grocery store came from zone 21. Zone 20 (Burbank, Glendale) - This zone is similar to zone 21, except like zone 22, it is in the cold air basins. The growing season is from 240 to 290 days. Zone 19 (Riverside, Pomona) - This zone has ocean influence only 15% of the time. This area is subject to Santa Ana winds. This is not a good zone for plants that require some humidity. The growing season is from 270 to 340 days. Historically this was prime citrus country. Zone 18 (Van Nuys, San Bernardino) - Like zone 19, this area gets little ocean influence. Like zones 20 and 22, it is in the cold air basins. This is the coldest zone of seven described here and freezes can be expected every year. The growing season is from 240 to 280 days. 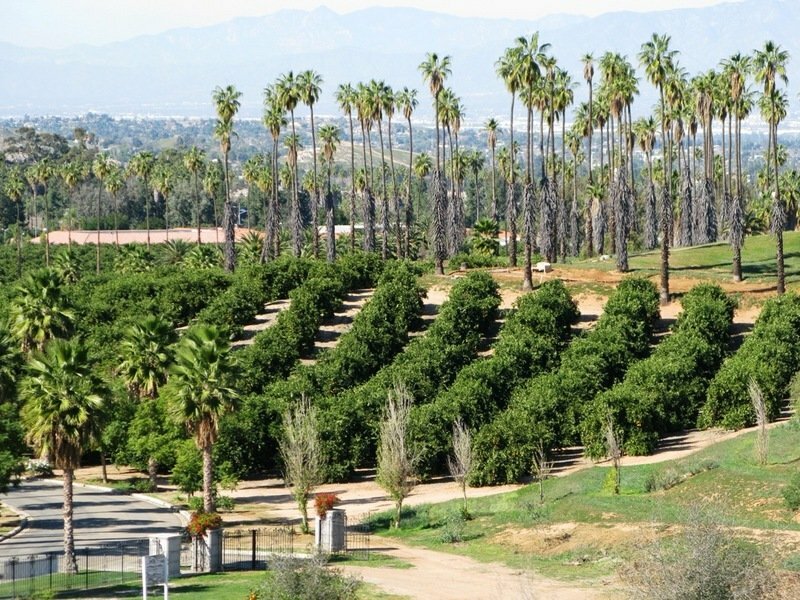 This area is a little too risky for commercial citrus but it once produced a variety of crops like walnuts, sugar beets, and winter wheat. Sunset zone 13 is interesting. 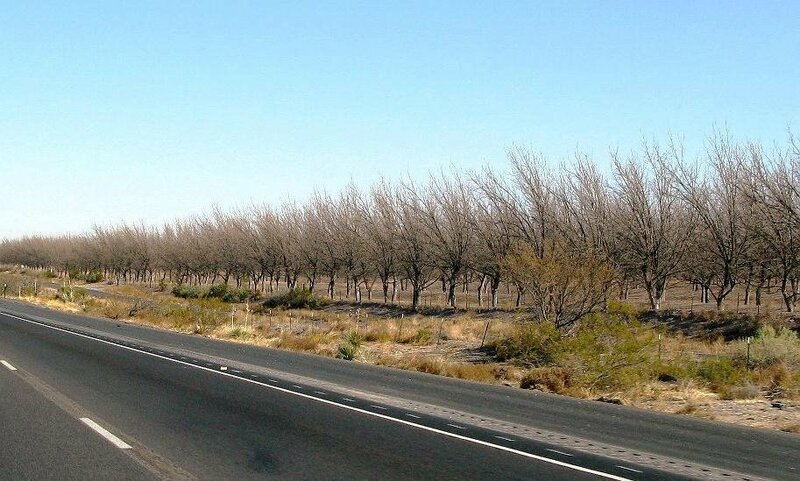 This is the low elevation desert of Arizona and California. Zone 13 has two growing seasons, the first from February to May and the second from September to December. June through August, it is so hot that most plants do not actively grow. One would never gather this information merely from the USDA zone. You might think that having so many zones is really splitting hairs, but I have noticed a difference. I used to live in zone 18 in the bottom of a canyon and the temperature under the porch roof would get to 28°F multiple times a year. Several times, things that were planted around my apartment complex froze to death. Southern California staples like bird-of-paradise, orange trees, and bougainvillea were not seen in the neighborhood. Now I live about 12 miles away from there on the side of a hill and in zone 19. It gets below 34°F less than once a year. I think the coldest I've seen here is 30°F. Orange trees and other subtropicals are ubiquitous. My experience with Sunset zones is that they are very useful. My section of Sunset zone 19 is classified as USDA zone 10. USDA says I should be able to grow fuchsias and tuberous begonias. Sunset says that they do not do well here. I have tried them both and found that Sunset is correct. Of course even Sunset zones have limitations. You may find that your yard has microclimates that do not fit your indicated Sunset zone. How does one use Sunset zones? Go to the Sunset website, the book Sunset National Garden Book, or Sunset Western Garden Book. 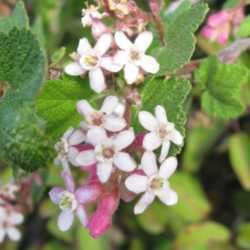 In using the web site, go to the Plant Finder site, and click on "Find My Sunset Climate Zone". A map of all of the zones will come up and you can click on it to enlarge the regions if desired. After finding your zone, go back to the Plant Finder page and you can sort and search for appropriate plants by checking off the characteristics of interest or you can search for a specific plant by putting the name in the "Find" box. The books are organized into sections. First there is a section of maps and descriptions of the zones. Then there is guide on choosing plants for specific situations, for example, plants for shade or plants that attract butterflies. The bulk of the book is a listing in alphabetical order of thousands of plant species and varieties, with a short description of the plant and its growing requirements and the zones for which it is appropriate. At the end of the book there is a short gardening encyclopedia. If you live in an area where winter cold is not your biggest gardening challenge or if you would just like more information, investigate the Sunset zones. The online information is free. My experience has been that the western book is commonly sold in bookstores and in some nurseries and of course both books are sold by online dealers. Many copies and editions of these books have been printed and used books are readily available.